Jeannette Stutzman is an oil and pastel landscape artist with an expressive style, focusing on dramatic compositions and effects of light. Jeannette was awarded "Best Oil Painting" for her painting "Trading Post" at the 35th Annual Western Spirit Show in Cheyenne, WY and 2nd Place for her body of work at the 2017 Pastel Society of Colorado Signature Member Show. 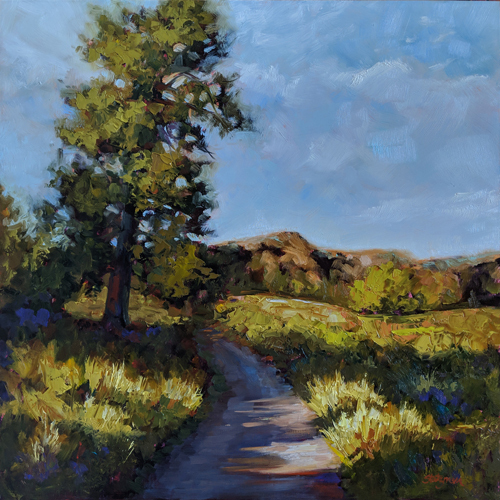 Jeannette is proud to be represented by Mary Williams Fine Art in Boulder, CO. While viewing the portfolio please click on the images to open a large view of the piece. Scroll down for information about the piece. While viewing the abstract portfolio pieces at full size, notice the links to the youtube videos of the songs/bands that each piece was painted to. Jeannette often photographs the locations and scans in her value sketches to include along with the finished image. These supplemental images, when available, can be accessed once the image is viewed full size (scroll to the bottom and click on the thumbnail to open along with the large finished painting).